The rise of social media management software has completely changed the face of digital marketing forever. Thanks to it, there is a whole new set of standards for what makes a successful digital marketing campaign. And this is good news for your business. But like any powerful innovation before it, social media can be a little overwhelming at times. If it isn’t the nightmare of keeping up with many different active social media accounts, it is the horror show of trying to track clicks and conversions fast enough across different social spheres to make changes to your strategy that were actually relevant. In every sense of the word, social media engagement is a living thing. A live, ongoing conversation with people that your business cares about. As a business you have to stay on top of this conversation at all times, which makes social media management software so important to incorporate into your social media strategy. The average social media management software will help combine, track, and analyse conversations across several social platforms from the same dashboard. You can track inbound and outbound brand mentions, as wells as social marketing campaigns. If you are yet to decide on which of the many social media management suites to use, that choice will depend largely on the needs of your business. With the constant evolution of social media, the need for authentic connections with your audience on an individual and personal level is becoming ever more urgent. Hootsuite enables businesses to carry out impactful communication strategies across many social platforms. Its mission is to empower businesses to transform these communications into meaningful relationships. The first and most obvious benefit of using Hootsuite is that it enables the management of a large amount of social media platforms at once. With this software, your business can post content and review responses on up to 35 popular social networks including Facebook (Profiles, Pages, Groups, and Events), Twitter, and LinkedIn (Profiles, Pages, and Groups). You can update all of your social media platforms in a single step. The synchronisation of content delivery across several different platforms allows for optimization of content delivery. This is most useful when you need to get an urgent message out to your customers quickly. You can monitor brand mentions across networks and this helps in testing the pulse of your social media campaign and the strength of your brand. Their analytics tools provide reports, metrics, and visual streams that will help you zero in on what is working and what isn’t. Hootsuite provides a weekly analytics report via email that highlights important metrics such as: number of clicks per day, the geographic location of those clicking through, most popular links and top referers. This report is free and available to all users, even those on the free plan. Note that this particular feature is most useful if you mainly, or only, use Hootsuite as your social media management suite. This is due to the fact that click-throughs are only tracked through the software’s ow.ly URL shortener. If you favor other social management tools at the expense of Hootsuite, your weekly reports might come through blank! Hootsuite makes working with a social media team a lot easier and more efficient. Team management comes with a lot of difficulties. For example, how can you make sure that two or more members of the team are not responding to the same status at the same time? Hootsuite allows task delegations which solve this problem perfectly. For example, imagine your business gets eighty mentions in one day. The administrator could delegate different mentions to different team members. Once a team member is logged in they can see which task has been allocated to them and not encroach on a teammate’s assignment. Another feature that makes Hootsuite beneficial for teams is the messaging feature. Team members are able to send private messages to each other. This is particularly useful if your team members are part of an outside agency, freelancers outside the office, or work-from-home employees. Companies that make use of Twitter as a tool for customer care can take advantage of Hootsuite to get closer to their customer base. This software allows you to store draft messages, for example, which can be used to answer frequent queries like directions to the office. The team feature also allows the delegation of customer queries to different members of the team so that the business stays on top of the conversation. Hootsuite’s shortfalls are mainly related to its URL shorteners, cost structure, reporting functionalities and team member features. Hootsuite provides the URL shorteners ow.ly and ht.ly. While this is a convenient feature, it comes with some obvious drawbacks. First of all, you are forced to use them since only clicks added through Hootsuite are considered in the analytics reports. Therefore, if you use other social media management services, your analytics from Hootsuite will always remain incomplete and one-sided. Another drawback to these URL shorteners: they announce to the world that your business uses Hootsuite. It’s possible to add your own custom URL shorteners but these can cost you up to $49.99/month or $588.88/year on top of domain registration costs. And despite that, you can only use these custom URLs through the browser version of Hootsuite while still having to rely 100% on Hootsuite reports since you won’t be able to use your custom URL on other apps such as Buffer or Social Sprout. Hootsuite provides free ow.ly reports which go a long way to show how well these particular links are doing. All other reports come with a $50 price tag… each! So basically you pay a considerable amount for reports that might not be complete if you happen to use other social media management tools as well. Small companies and individuals may find find that too much to bear. If you use Hootsuite to post to Facebook, you may run into some problems. If you use the bulk scheduler or post directly from an RSS feed, your post is going to appear purely in text format. It’s common knowledge that posts with photos and a summary gain much more traction on Facebook. Circumventing this drawback will require you to post a single update or use the standard scheduler. Another, perhaps more alarming, disadvantage to using Hootsuite to post to Facebook has nothing to do with the software in particular, and everything to do with Facebook’s relationship with 3rd party software. There is extensive evidence to back up the claim that posting on Facebook via 3rd party software results in 89.5% less engagement. This is most likely because content that is posted in this manner tends to appear automated and therefore less appealing. It’s important to customise your Facebook posts so that your audience does not feel excluded. Some of Hootsuite’s best features are those pertaining to team management which allow many people to access different social media sites without necessarily needing to know the password to each site. This works well from a security and customer care standpoint. That said, team features can be expensive, making them ideal only for large corporations which can afford them. For example, following the Team plan you get 3 users for $34.99/user/month. If your social media strategy requires more people you will have to upgrade to the Business plan which costs about $7000/year. 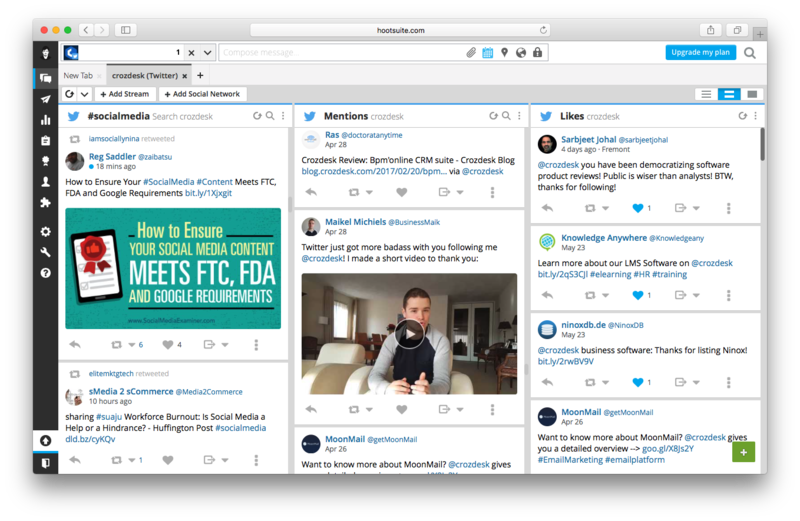 If you are an individual – say a freelancer – or part of a very small social media team working for an SME that is hoping to boost their social media engagement, then Hootsuite is probably a good fit. However, owing to the high costs associated with extra features, some supported Hootsuite workflows are best suited to larger enterprises or organisations with a significant budget allocated to social media management and social engagement. 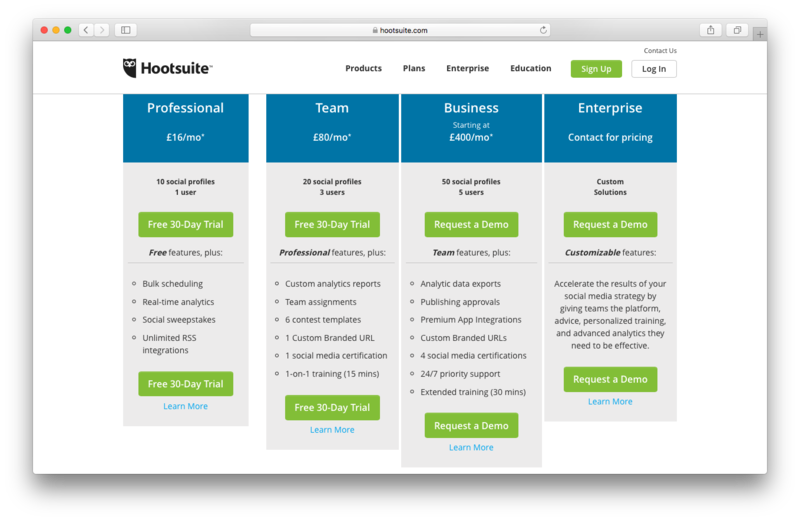 Hootsuite pricing is based on a freemium model. There is a free version, and also a free 30-day trial period for a Pro plan. An Enterprise plan also exists. Because social media is an ongoing conversation with an audience you care about, it can act as a disruptive influence on your personal schedule. Hence, Buffer was created. Rather than having to take a break every few hours or so to update your many social profiles one after the other, you can simply schedule them in advance through Buffer. The same applies to multimedia content, such as videos and photos. 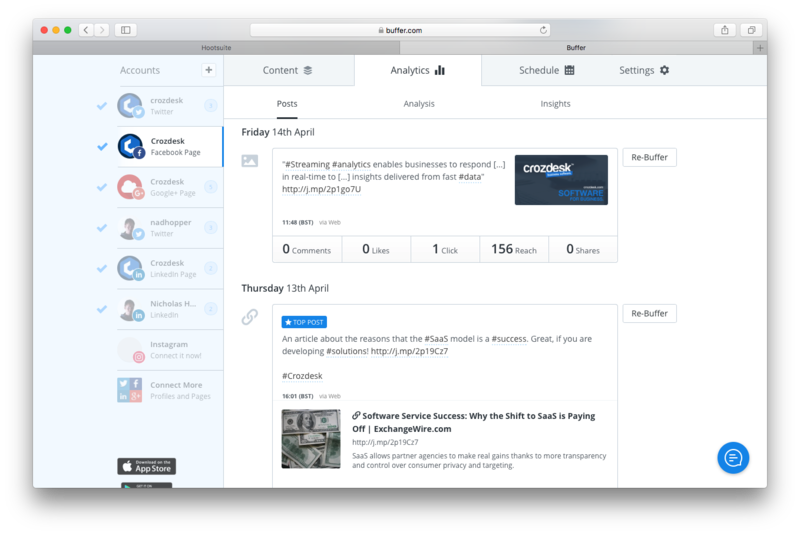 With Buffer you can take your social media game to the next level by planning, publishing, and analysing your posts and media all in one place. It’s possible to select which accounts you would like to post to, and also customize your posts to make them more relevant for each platform. With Buffer you get the chance to share content across multiple social accounts from one central location. Rather than logging into each of your social accounts, you can just log into Buffer and create all of your social content from there. With Buffer you can schedule your posts to a T. The scheduling features allow you to either: share immediately, share next, or share at a specific time. No matter the account you created the post for, it is possible to share it to other social accounts by simply selecting multiple account icons. You can choose the best times for posting so that you never have to worry about spamming your audience all at once. If you are not sure of which times are the best, it’s possible to take advantage of Buffer’s Optimal Scheduling tool that incorporates data from your profile along with others in the same time zone to give you suggestions on the best possible times to post. The Analytics section quickly reveals your progress over time: your most popular posts, least popular posts, the amount of engagement, and so on. You can make use of the “rebuffer” button to republish your most popular content with one click. Buffer goes one step further than allowing you to just add videos and images with your content. With the Pablo tool you can create customised images in seconds for your content. This tool allows you to choose images from the library or upload your own; add texts and quotes; overlay a logo; and resize for the different social platforms. It allows you to choose your default URL shortener to be bit.ly, which is the popular choice currently. You can also choose between buff.ly and j.mp. This helps you track your click-through rates without announcing your choice of social media tool to the whole world. Buffer also allows you to schedule and ‘pin’ on Pinterest via a paid third party app called Tailwind. The Free plan and the Awesome plan (costs $10/month) do not support team members. If you plan on bringing others along on your social media journey then you will need to upgrade to one of the Business plans where the pricing starts from $50/month. Buffer’s social analytics and reporting are reserved solely for higher paying tiers. Furthermore, it is not shipped with monitoring tools for searches, hashtags, and mentions. This means you need to get this information directly from those social platforms or use other social media management apps (in case you cannot afford to bump up to the Business tier). Buffer is an excellent (and relatively low-cost) app for the scheduling and planning of posts across major social networks. That said, if social media management is what you are looking for, then this SaaS is probably not the right one for. 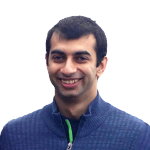 Among other things, what Buffer offers you is the chance to master your publishing schedule freeing you up to concentrate on other important aspects of your business. Buffer runs a variety of plans to deliver solutions which include a free plan that allows you to use a single account per platform. 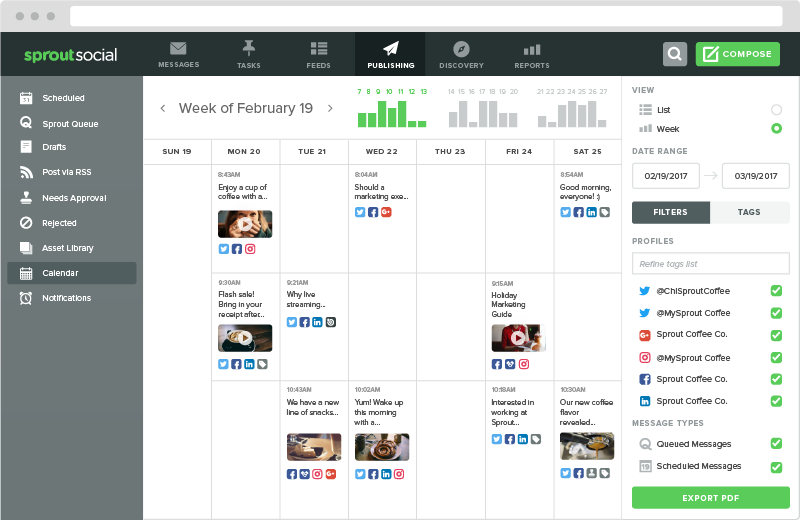 Sprout Social makes it easy to start, monitor, and analyze social interactions. Its three main functions — engagement, publishing, and analytics — are designed to make it easy for businesses to turn the daunting world of social media into a clear advantage. With Sprout Social you can easily spot prospective clients and engage customers regardless of the problem or question they may have. There are plenty of tools available that make it possible to streamline and optimise the social strategy being used across multiple social platforms. One of the best things about Sprout Social is the clean, unobstructive design. The dashboard is clearly organised into different categories that are very easy to navigate. This allows businesses to quickly get down to brass tacks. Sprout Social takes guesswork out of the equation with its analytics suite which produces several visual reports good for use in presentations. It also allows customisation of these reports for additional relevance. With the engagement tool, you can always stay on top of conversations that matter most to your business. It gathers all relevant messages from across the social sphere: Facebook, Google, Instagram, Twitter, and Messenger- straight into your inbox. You can make engagement a team effort to increase efficiency by assigning different messages to team members. With Social Sprout it’s possible to compose, publish, brand, edit, and share your posts to several social networks from one single place. It’s also possible to edit and store images in a single content repository for the whole team to access easily. Sprout Social integrates with Facebook and LinkedIn but posting in groups on these platforms is not as straightforward and easy as one would like. Sprout Social’s decision to stick to a single work-stream rather than providing multiple work-streams may leave some people frustrated. If it’s any consolation, those in charge at Sprout Social insist this design is intentional and aimed at maintaining a clean design and streamlining workflow. Sprout Social lies on the more expensive end of the spectrum as far as social media management tools are concerned. The publishing features offered, while excellent, are not as good as those offered by Buffer. Sprout Social is a great tool if you aim to fully commit to social media management. The analytics offered are very comprehensive, and can be customised in a number of ways to suit your particular needs. Sprout Social offers a variety of plans ranging from the Standard Plan that serves those who are just getting started with social media management, to the much more comprehensive Enterprise Plan. Each plan comes with a fully functional 30-day trial free of charge (you don’t even require a credit card). Which Social Media Management Suite is best for your business? It’s a simple choice based on what you have planned for your social media campaigns. Chances are that you will find your needs matching closely with one of the categorizations below. If you are looking for a great way to schedule and share content across social media, or simply looking for an easy, low-threshold foray into understanding the world of social media management, then Buffer will offer you the most value among these three. Their analytics are not the most in-depth, but can help you differentiate what is important going forward and what is not. If you are in need of better analytics on engagement across social media, or have a desire to handle customer care across all your social media platforms then Sprout Social appears to be the best option for your business. Mid-to-large sized businesses capable of handling the costs of insightful in-depth reports will do well with Hootsuite. This option also makes sense for companies that require multiple streams and user management in the same space. It is only when you use these tools on a day-to-day basis that you will begin to see the intricacies in design, pain points covered, or workflow patterns that suit your workflow. In the end, you will be left with what should be an obvious choice for both your users and your business.